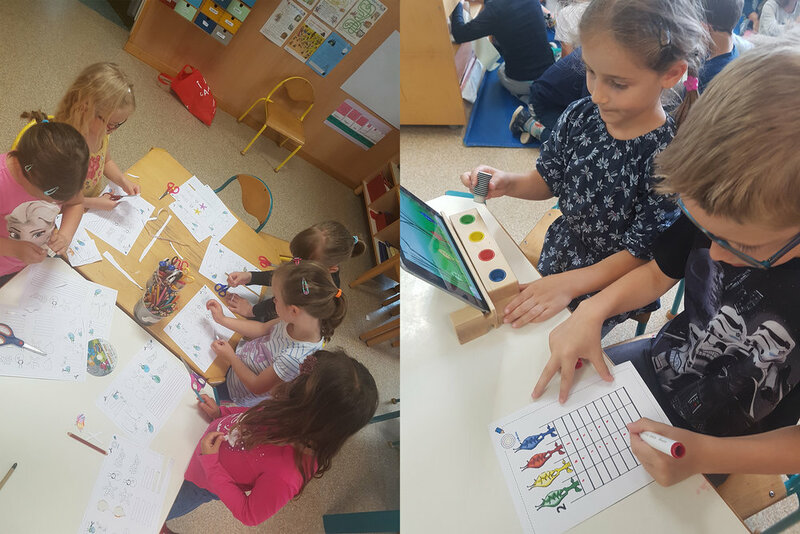 Last week we asked a teacher to trial PAKABO in her kindergarten in Celje, Slovenia. In the preparation for the lesson the teacher planned to use the PAKABO set in pairs (1) to encourage the cooperation and socialisation between children, (2) to solve cognitive problems in a fast paced environment, (3) to develop handwriting (both cursive and print), (4) to introduce children to letters and numbers and to develop mathematical logical thinking and (5) to practice Maths skills such as counting and classification. For each PAKABO digital game the teacher created a table, where children would note down and count the hits, catches and other correct actions in the games in order to classify and count the results of the game play. For Bungee bugs games a sheet with a table for 4 coloured bungees was created. For memory game a sheet with all 4 objects were created. For underwater scene different table was created. Table for the beach level. The teacher organised her classroom so that one table had 1 PAKABO set with 1 iPad, while on the other 3 tables children worked on tracing sheets with pencils, crayon, scissors and glue. Children worked on the tracing activities, with one pair playing the PAKABO games on the controller. While playing in a pair, one child played a game (a player), while the other one observed the game action and noted down the score in the table (a note taker). When the game finished the teacher asked children to sum the numbers. After a game the children would swap places. When both children finished with the playing, a new pair would sit behind the PAKABO set. In the session children would note very carefully the correct actions (i.e. hits, catches...) in the table. In some instances the pair would exchange words to confirm the action. This was either initiated by the note taker who would ask for confirmation of the correct action the player, other the player would ask the note taker if she noted the correct action. The rest of children worked on the tracing and graphomotor sheets. Girls were more successful with the bands and rings and managed to complete four of them, while the boys mainly worked on the trucks and balloons. The paper exercises were challenging enough to compete with the digital games and also to work for 90 minutes. Working in pairs worked well and it did not interrupt required level of concentration which is needed to solve cognitive problems in a fast pace environment in a digital game. Paper exercises for handwriting were well received and clear. Teacher’s intervention was mostly needed at the begging of the lesson and at the first game while working in pairs. The tables created for this session were also a good exercise for Maths curriculum (counting, sum and classification). Teachers’ feedback was very positive. With the tables they found another way to put some applied maths into their teaching using digital games. Such exercise could be easily adapted for other digital games children like to play either in school or at home. This strategy proved a good solution for managing the screen time of children. Many parents are very worried about the time children spend playing digital games. One of the reasons is the lack of understanding what children do on their tablets and computers, because parents are not involved in the play. This lack of involvement is one of the reasons that parents mistrust digital games. The teacher suggested that parents could simply just play in pairs with their children, like the teachers have demonstrated above. Such cooperation would introduce them to digital games and at the same time offered them an active method to manage the screen time and bring parents and children together. We would like to thank to headmaster Ms Mateja Kobal, teacher Ms Urska Mastnak, children and parents of Vrtec Zarja Celje for the visit.